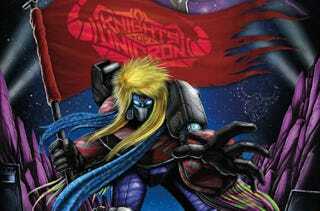 No words can do these things justice, so here are the facts: Hasbro will be releasing a special set of Transformers as an '80s hair metal band called the Knight of Cybertron as a San Diego Comic-Con exclusive. They have actual hair. They are the greatest @#$%ing toys of all time. Yes, Optimus Prime is wearing two different animal-themed spandex prints, Megatron is wielding a guitar that transforms into Laserbeak, Soundwave has a mohawk, and Jazz is CALLED SMOOTH JAZZ FOR @#$%'S SAKE. Smooth Jazz, by the way, wields Ratbat who turns into a keytar. This must be what it felt like for people to see the Sistine Chapel the first time. You can see Smooth Jazz, some more pics and the amazing packaging for the set over at ET Online (seriously). The set will run you $184.99 for all six figures, as well as the "roadie case" packaging, which is filled with "special edition posters, stickers, a concert ticket, All-Access VIP pass, and tell-all history booklet depicting the journey of the Knights of Unicron, from their humble beginnings and formation to their stellar hits and 'look' (glam rock deco, metal band hair), band infighting (the titanic egos that once tore them apart), and triumphant return to the stage." I guess $185 may seems like a lot... at least until you remember you're paying for a figure named Smooth Jazz who has a robot bat that turns into a keytar. Then it seems like a goddamned steal.